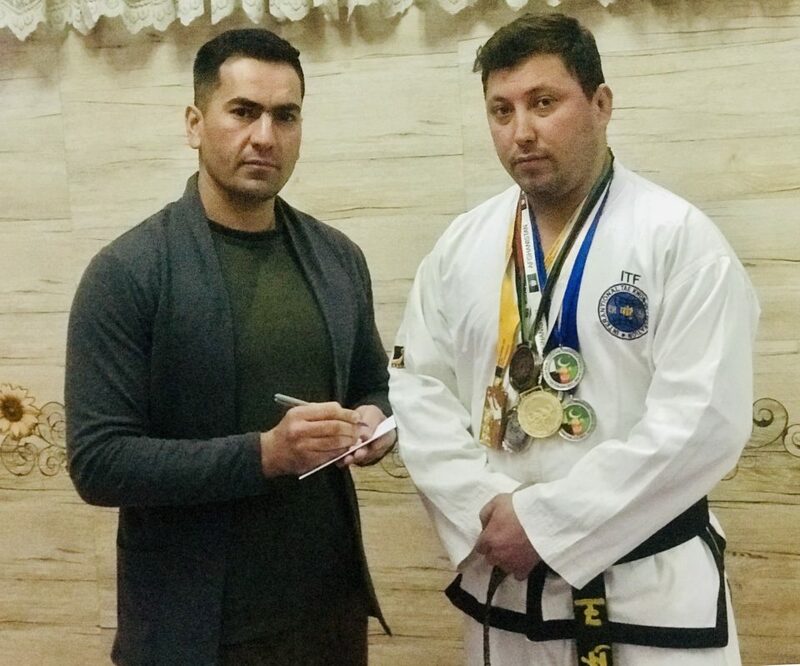 Borne in 1992 in a sport loving family, Nematullah Yusufi holder of Dan-3 belt from I.T.F International Taekwondo Federation and an athlete of Afghanistan I.T.F taekwondo. He was graduated from high school and due to economic constraints, he failed to complete his higher education. But he managed to bring good prides to Afghanistan through sport. In the outset, talking on his activities, Yusufi said, in 2005 I started Taekwondo basically and professionally and managed to achieve membership of national team in 2008. In 2009 national team competitions, I achieved first position and a gold medal in 74kg weight and totally I achieved 4 gold, 3 silver and 2 bronze medals in domestic competitions. Touching his trans-border competitions, Yusufi said, in 2011 international competition hosted by Pakistan, I achieved a gold medal to Afghanistan sport community. In 2012 I attended a competition in Tajikistan but failed to gain a medal. Due to intensive exercises and efforts in 2016 I attended a competition in Pakistan and gained a silver medal. In 2016 again I attended another international competition hosted by Nepal and achieved a gold medal in the weight of 98kg. Totally I achieved 3 gold, one silver and one Bronze medals in trans-border competitions. Currently I am a trainer in MoI Sportsmen Association. Talking on the mystery of his success, Yusufi said, everybody should setup clear goals and programs in his/her daily life, and exploit time properly. Particularly a sportsman who attend international competition should remember the word of championship in his mind. This motive causes to appear stronger on the stage and bring pride to the people and country. Touching the peculiarities of a professional sport trainer, he said, a professional sport trainer should not think merely to power and championship of his trainees but should also invite attention to their soul and mental health. Continuation of regular daily and weekly exercises and indiscriminate approach with all trainees is a vital principle of a professional trainer. Commenting on the role of sport in contemporary society, Yusufi said, availability of sport grounds and gymnasiums provide this opportunity to youth and teenagers to foster their talents. Today, the new generation merely learn order of social law in a sport environment. In a sport complex everybody from all ethnic groups exercise under a single umbrella and sport plays basic role in solidarity and convergence of brother tribes. Sending his message to youth, he said, sport causes mankind’s physical and mental health and so I request our dear youth to exploit this God Sent gift.